14 Aero sailors turned up to Brightlingsea on Saturday 17th September to what could be best described as an interesting forecast. After a week of intense heat Autumn had arrived and a front had passed overnight bringing heavy winds and rain but had not completely cleared through leaving a brisk breeze which was due to drop in the afternoon. Class rules allow sailors the opportunity use a smaller rig than entered in PY racing but with the larger rig’s handicap. Thus 4 for the 9 rig sailors opted to use 7’s for Saturday in the knowledge that Sunday’s forecast was rather lighter. Full respect however goes to Matt Thursfield for having the Kahunas to sail the feisty Saturday in his 9 rig. The sail out to the start was epic with wind against tide, there were some terrific waves to scream off. One sailor more used to sailing inland was heard to say it was definitely the fastest he had sailed in two years of having his Aero. With the wind blowing straight down the River Colne the course was a triangle, sausage with a beat up tide in the channel and then a screaming reach out to a wing mark on the bank or a nervy run down channel into the worst of the waves. The boys at the front seemed to be enjoying themselves but those further down the fleet were in survival mode with many tacks seen at the gybe mark including in the Merlin and Fireball fleets who were sharing the same event. Two races were quickly dispatched with the second shortened after a dislocated shoulder in the Merlin fleet and gusts up to 30 knots recorded on the committee boat with the breeze definitely not dying off as forecast. Time to get back to the club before the ebb tide set in too hard and competitors were too tired to make the most of the evening meal and revelry lined up for the evening in the club. Sunday dawned to much less wind and forecast to drop further as the day progressed. Time for the wimps to put on their 9 rigs. Again with the breeze in the North it was a run out to the start but with less wind no big waves to play on. Three races to sail and again it was a case of a beat up the channel with tide and then a reach out on to the bank, gybe round the wing mark and down to the leeward mark, beat up again then a tricky run trying to decide to go direct or go out to the sides to avoid the worst of the tide. Richard Smith sailing a 7 rig sailed terrifically well in the chop often sailing just out of the channel in flatter water but definitely powering his boat through each wave and gust and often matching the 9 rigs to the top mark. The extra power of the bigger rig was only making its mark off the wind. The breeze slowly went left during the day and died off skewing the beat on to the bank at the top making it more difficult to judge the tide as it also dropped off near high water. Three races were again dispatched in short order with some different faces coming to the fore as the conditions changed. Race 3 was completed as the breeze started to really falter and we were able to sail back to the club before the ebb set in too hard. With racing completed the next challenge was the race to load a six stack trailer as the Class Manager was booked on the evening train to France to deliver boats to Lake Garda for next weekend’s RS Aerocup fun in the sun at Malcesine. Given such a diverse bunch of people, aged from 16 to 70 with one lady and such a huge variation in weather conditions this really was an event to test all abilities. So congratulations to Peter Barton, Class Manager, for winning but people are starting to snap at his heels so it won’t be long before he doesn’t have it all his own way. Had Richard Smith not been OCS in Sunday’s first race the event would likely have been his. 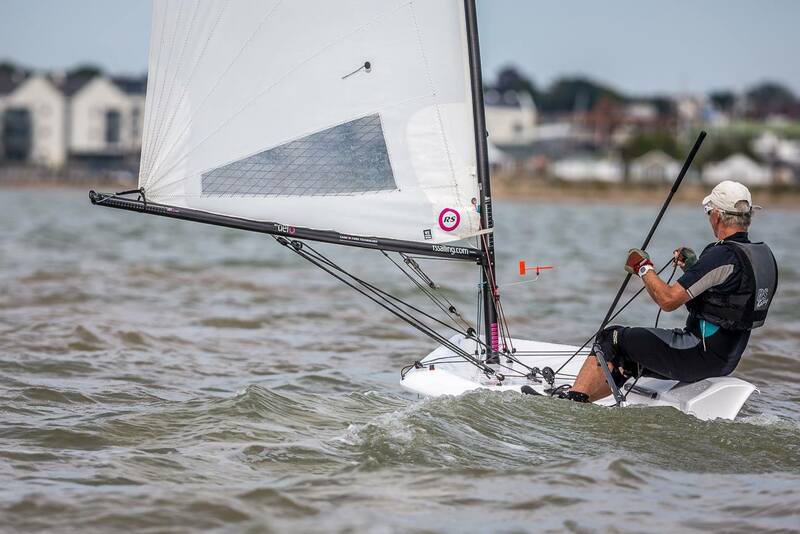 Sean Craig flew in from Ireland to represent the Royal St George YC and pulled out a few handy results for a 4th overall. Good luck to those lucky enough to be sailing in Garda next weekend and we look forward to hearing all the tales of mischief and sailing. Our intrepid Class Manager arrived in Brightlingsea on Friday evening to find the club closed but quickly found the local hostelry “The Yachtsman’s Arms” and was soon invited to join the local sailors Friday evening revelry quickly followed by a curry in what he described as the best event welcome ever. Can Garda possibly compete?? Many thanks to Brightlingsea Sailing Club for a great weekend and also to Mark Hainsworth for being the Aero man assisting on the committee boat.